Please consult the photograph above for details of the product’s packaging, design and retail presentation. 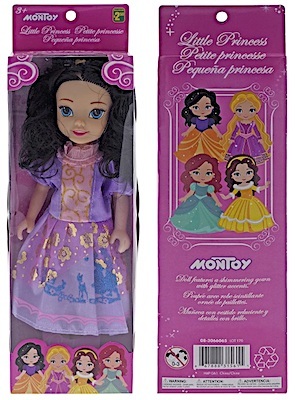 According to Health Canada, the plastic Doll contains levels of Phthalates in excess of those allowed under Canadian legislation and may pose a consequential chemical hazard. Studies suggest that certain Phthalates, including DEHP, may cause reproductive impairment and developmental abnormalities in young children when soft vinyl products containing Phthalates are sucked or chewed for extended periods. If you believe you have purchased or have in your possession any of the recalled Children’s Dolls, please do not use them nor let your child play with or near them. Instead, kindly return the product to the store where you purchased it for a full refund. Disposal of this product must be in accordance with local municipal hazardous waste requirements to protect your personal safety, the local drinking water supply and the ecosystem. For further information on Phthalates in children’s products, please see Health Canada’s Web site here: https://www.canada.ca/en/health-canada/services/toy-safety/soft-vinyl-toys.html. If you have any questions about this recall notification, please contact Dollarama toll-free at 1-888-365-4266, 24 hours a day, seven days a week. Alternatively, you can visit the company’s Web site at https://www.dollarama.com/en-CA/corp/contact-us. ==> To see other recalls and notifications caused by suspected faulty and/or dangerous Children’s Dolls, please search for “dolls” or more generically, “children” using the Search Box at the top of this page. ==> To see all recalls and notifications relating to Reproductive Impairment hazards, please search for “reproductive” using the Search Box at the top of this page. ==> To see all recalls and notifications relating to Developmental Abnormalities hazards, please search for “developmental” using the Search Box at the top of this page. ==> To see all recalls and notifications relating to Infants and Children, please search for “children” using the Search Box at the top of this page. ==> To see other recalls and notifications for products manufactured, marketed and/or sold by Dollarama LP/SEC, please search for “Dollarama” using the Search Box at the top of this page.